Nineteen of the state's 59 species of lizards thrive in the natural, open spaces of New Mexico's urban center. While the state's most populated city, Albuquerque comprises much of the Lower Angostura reach of the Middle Rio Grande Bosque ecosystem, a wooded riparian area that provides critical habitat to many species of wildlife, including a number of unique lizard species. 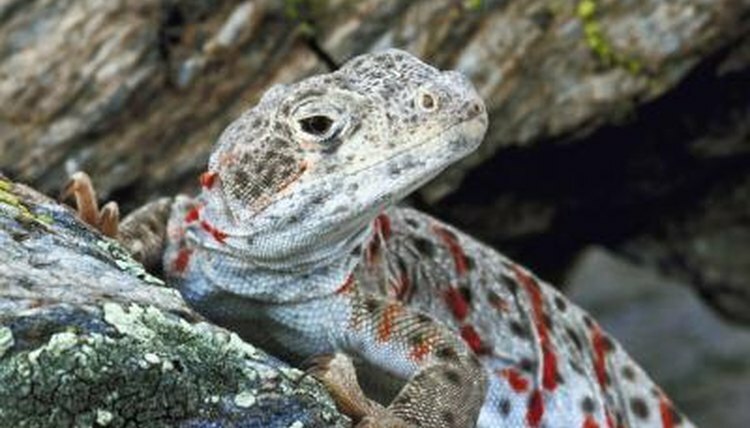 Albuquerque is home to two members of the Crotaphytidae family, a small group of carnivorous, desert-dwelling lizards. Both species are capable of running at exceptional speeds -- as fast as 16 mph -- often on just their powerful hind legs. The medium-sized Eastern collared lizard is a highly territorial species that preys primarily on insects, but will consume other lizards. Males are most colorful, with a bright turquoise body and yellow head, but both sexes sport the characteristic two black bands around the neck, giving the lizard its name. The long-nose leopard lizard is a large-bodied, aggressive predator that stalks its prey: insects, rodents and other lizards, including members of its own species. Females are larger than males -- about 5.8 inches snout-vent length compared to 4.8 inches. No coloration differences exist between the two sexes, except during breeding season when, as with other members of this family, females develop red and orange pigmentation on their head, torso and tail. The remarkably diverse family Phrynosomatidae is well represented in the state, with seven species occurring in Albuquerque. The speckled earless lizard, like all species of earless lizards, has no external ear openings. Other small members of this family include the southwestern fence lizard and the smooth tree lizard; two species that look superficially similar, except the latter has smooth versus coarse scales. A common resident of Albuquerque, the Eastern side-blotched lizards exhibits a unique form of polymorphism whereby males have either orange, blue or yellow throats. This color influences not only how they compete for mates, but also yearly survival rates. Like rock-paper-scissors, no linear hierarchy exists, as one morph may fare well against the other, but do poorly against the third. One of the more unusual groups in this family are the horned lizard species, three of which occur in Albuquerque. Often called horny toads, horned lizards have broad bodies, rough scales, and unlike toads, five-clawed toes on their forefeet, as well as a tail. When provoked, horned lizard species may shoot a fine stream of blood from their eyes, at distances up to 6 feet. In Mexico, this remarkable feat has led many to regard horned lizards as sacred, believing the animal is weeping tears of blood. All three of Albuquerque's horned lizard species -- the Texas horned lizard, Hernandez's short-horned lizard and the roundtail horned lizard -- are protected under New Mexico law. Of the more than 5,600 species of lizards on earth, more than a quarter -- 1,510 species -- are members of the family Scincidae, or skinks. Two species of skinks live in Albuquerque: the variable skink and the Great Plains skink. Both species have smooth, shiny scales, and a long tail, equal or greater to 150 percent of its body length. Like other species, these skinks may release their tail to escape predators -- a process known as caudal autotomy. The disconnected tail will continue to wiggle, distracting the predator from the fleeing skink. The black-bodied Great Plains skink has a bright blue tail, which presumably serves as a decoy. Eight of New Mexico's 19 species of whiptails -- members of the family Teiidae -- occur in Albuquerque, including the state reptile: the New Mexico whiptail. Whiptails are medium-sized, long and slender lizards that seemingly never stop moving. The state's pride and joy holds another unique honor: All New Mexico whiptails are female. The species arose as a result of hybridization between the western desert whiptail and the striped whiptail. The unisexual species therefore does not reproduce sexually, but rather by cloning. Offspring are genetic duplicates of their mother.